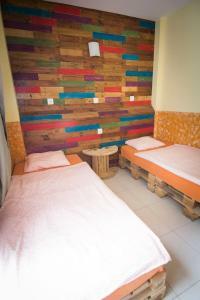 This lively hostel is located 150 metres from Badal Metro Station. It offers a free Wi-Fi zone, a chill-out terrace zone and free dinner. Sants Train and Metro Station are 10 minutes’ walk away. The air-conditioned dormitories at Hostel One Sants feature bunk beds and free lockers. Bathrooms are shared, sheets are included and towels can be rented. Laundry facilities are available for a fee. The communal kitchen is open 24-hours, has free tea and coffee and guests can make lunch and cocktails together. There is also a lounge where you can stay until late, playing pool or watching TV. The property is 20 minutes’ walk from Barcelona’s Camp Nou Stadium, Montjuic and Plaza España. One Sants offers free luggage storage until midnight and is 10 minutes’ walk from the airport bus stop to Barcelona El Prat Airport, 12 km away. This air-conditioned dormitory room features bunk beds and free lockers. Bathrooms are shared, sheets are included and towels can be rented. Laundry facilities are available for a fee. 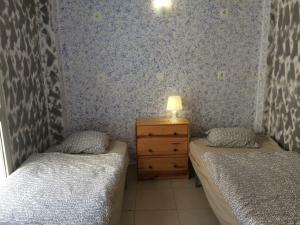 Rate: € 10.83 ... € 141.52; select dates below to get current rates.